March 2008. Placement time for seniors in Campus. Someone in my operations team was reading a blue coloured book with some “banker” written on it. I initially dismissed it off as some book on finance and did not find much interest. During one of the frequent late nights, sitting alone in the operations tent I happened to give the first chapter of the book a cursory glance and it got me hooked. I still remember completing the entire book in one go that very night. 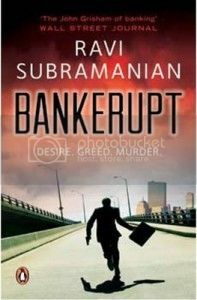 The book was” If God was a Banker” by Ravi Subramanian. Since then, I have been following the authors subsequent books and I have not been disappointed. The author’s latest BANKERUPT is an addition to the list. I had immediately pre-ordered the book when I had heard about its release (through a mailer list). Like Ravi’s earlier books, this premise of this story too is Banking filled with multitude of layers from diverse fields – Gun control Act in US, Academic world in Boston, Emu farming in Coimbatore, Slum Manufacturer in Dharavi, etc.. and how they all tie in seamlessly. Coimbatore – the MIT professor’s father who runs a business of bird farming. The three parallel tracks set the premise for the second half where the scene shifts to Boston. The author manages to keep the reader guessing till the very end and then reveals out a totally unobvious climax. No wonder he is known as the “John Grisham of Banking.. ” by a famous international newspaper. Giving any further information plot details might let the spoiler out and thus I would refrain from doing so. Overall, a light read for a lazy Saturday afternoon.